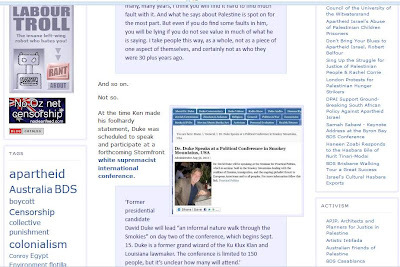 Ken O’Keefe, the former Gaza Freedom activist, who now parades under the slogan ‘trade not aid’, part of the neo-con zeitgeist, has now utterly discredited himself with his association with the ex-Grand Wizard of the KKK, David Duke, a neo-Nazi through and through. He falsely claims that Duke has abandoned the openly White Supremacist Stormfrontn - a lie which would take about a minute to uncover. 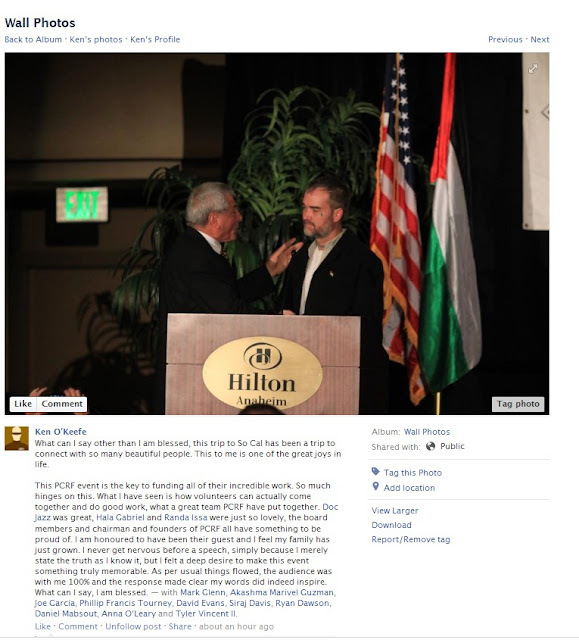 O’Keefe on the 12/10/12 delivers an address at the Anaheim Hilton for the PCRF - A PCRF representative has responded that this article will be shared today at a PCRF chapters meeting and that they are setting up a vetting committee for all PCRF speakers in the future. Anyone seriously interested in Palestine Solidarity should shun the man like the plague. He is only of interest as an object of curiosity. Whereas most of the far-Right today, like Marine Le Pen, snuggle up to the Zionists, those infected by biological racism like the Hungarian Jobbik Party still consider themselves ‘anti-Zionist’ i.e anti-Semitic and of course anti-Gypsy and anti-human. 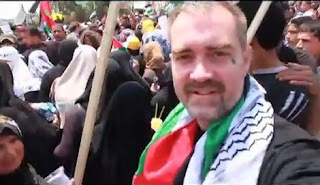 Recently Ken O’Keefe was visiting Gaza accompanied by Australian chemtrails conspiracy theorist Max Igan. 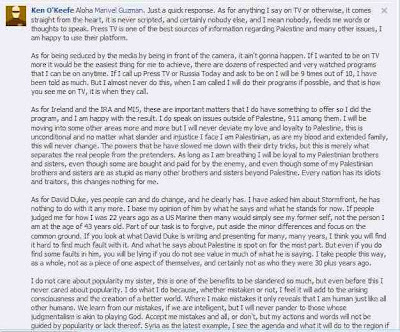 Here’s one of the reasons why Ken’s efforts as a bona fide Palestinian solidarity activist should be disregarded. 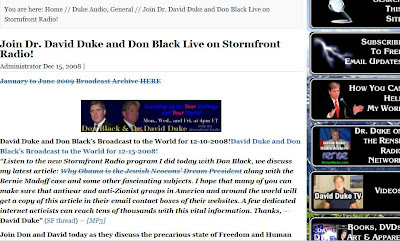 Last month on the 3rd September, Ken made claims David Duke was rehabilitated miraculously from his white supremacist alignment and has nothing to do with Stormfront anymore. 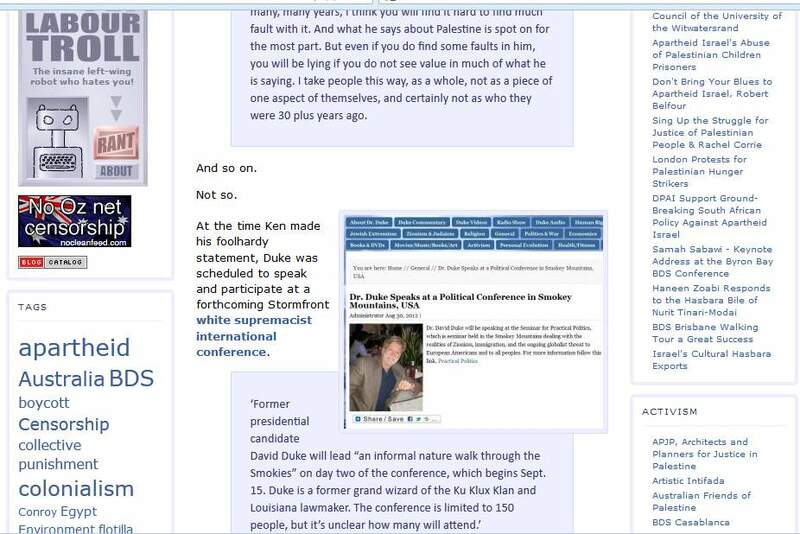 As for David Duke, yes people can and do change, and he clearly has. 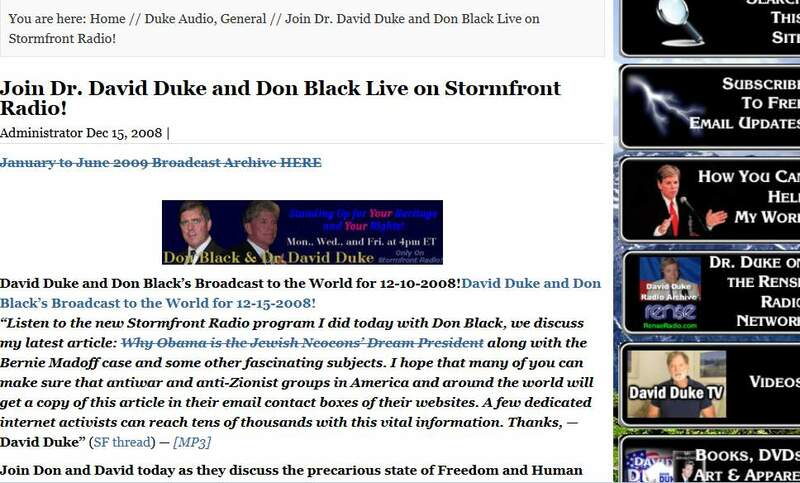 I have asked him about Stormfront, he has nothing to do with it any more. I base my opinion of him by what he says and what he stands for now. If people judged me for how I was 22 years ago as a US Marine then many would simply see my former self, not the person I am at the age of 43 years old. Part of our task is to forgive, put aside the minor differences and focus on the common ground. If you look at what David Duke is writing and presenting for many, many years, I think you will find it hard to find much fault with it. 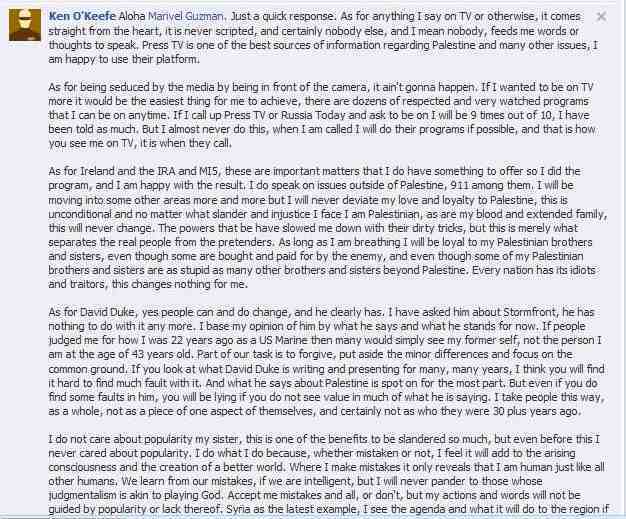 And what he says about Palestine is spot on for the most part. But even if you do find some faults in him, you will be lying if you do not see value in much of what he is saying. I take people this way, as a whole, not as a piece of one aspect of themselves, and certainly not as who they were 30 plus years ago. At the time Ken made his foolhardy statement, Duke was scheduled to speak and participate at a forthcoming Stormfront white supremacist international conference. We oppose the cynical and baseless use of the term anti-Semitism as a tool for stifling criticism of Israel or opposition to Zionism, as this assumes simply because someone is Jewish, they support Zionism or the colonial and apartheid policies of the state of Israel – a false generalization. By endorsing Duke and embracing him as a fellow activist, O’Keefe has besmirched these worthy, essential principles. 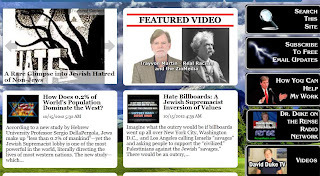 What do Breivik, CounterPunch, David Duke, Stormfront and the Jerusalem Post have in common? 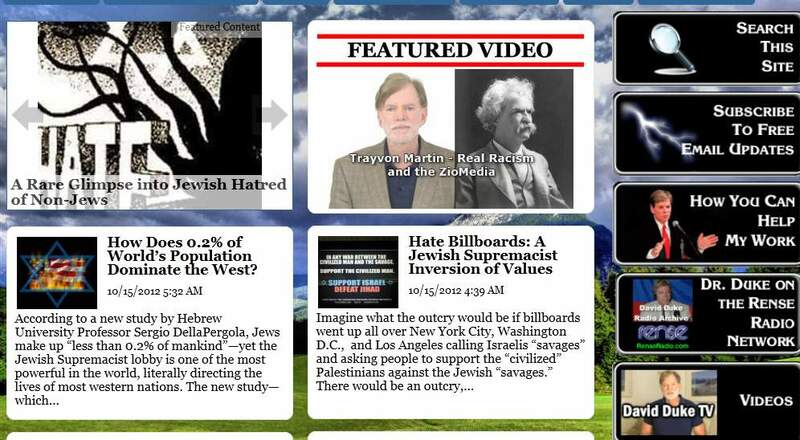 Sodastream - Zionists Mobilise and then Scatter!